This post describes and illustrates the Death Blossom with bv petals. It is most easily found as a secondary target while looking for XYZ-wings. Death Blossom Lite is a close, and easier to meet, cousin of the WXYZ-wing. First let’s deal with your homework. The NE 238 hinge is rejected as soon as we see that 3r3c3 forces 3r2c8 true. The NW 293-wing is made when the 9r2c5 sees the hinge 9 by ER, via the NE mirror box. This wing removes two candidates. Fortun-ately, without spoiling Sue de Coq’s historic illustration. The SW 237 hinge fails to see 2r3c3 and 7r5c3. The 2357-wing threatens, but has no victims. No candidate can see all four 3’s. Seeing this wing, I think about Death Blossoms, because a simplified form of death blossom, which I call the death blossom lite, is almost a WXYZ wing, but is better. In a Death Blossom, each number in a ‘stem” cell forms a common link with ALS ‘petals’. All of the petal ALS also contain the same ‘bee’ number, not in the stem. The petal candidates of the ‘bee’ number are a toxic set. Death Blossom is way back there in the Systematic Sudoku Order of Battle(SSOB), because the odds of finding one are so low, its better to wait until one is really needed. Howver, it’s another matter if the ALS are all bv. I call it a Death Blossom Lite (sorry Budweiser) , and keep it in the bv scan. With three petals it’s the WXYZ wing, but without a Z-candidate in the hinge. The reason the Z candidates are toxic is glaringly apparent in the lite, but a bit more subtle in the ALS Death Blossom. If none of the z candidates are true, the petals require all the numbers of the stem. As you look for XYZ hinges, and look over the bv field around possible WXYZ hinges, it’s an ideal time to also be open to the possibility of a Death Blossom Lite. 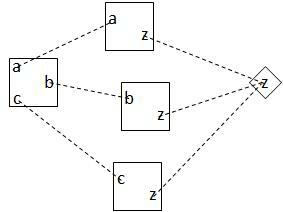 An unusually large number of bv with the same number might lead to a hinge of the companion numbers. A missing piece might be supplied with a forcing chain wink or an ALS petal. Stems have any number of candidates. Marking each the toxic set, we then look for victims, utilizing forced winks however outlandish. ©PowerPoint graphics makes it easy. The APE and APT of USAir Hemisphere puzzle of July 9, 2009 brings us to such a situation. The APE removal of 3r3c7 converted a wannabe WXYZ into a wannabe Death Blossom Lite. The victim sees the third 3 via mirrors in the C box. Next time, we take to the rails to see toxic pairs grow like dandelions. Its AIC the easy way. 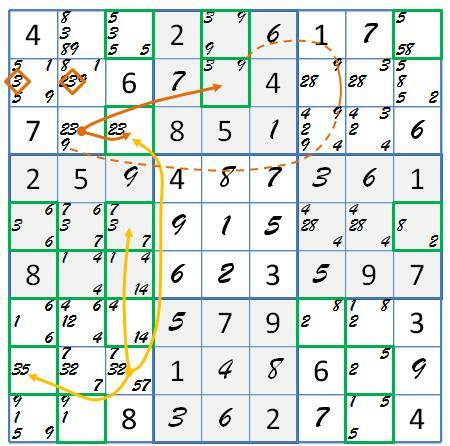 This entry was posted in Advanced Solving, Sudoku Toolware and tagged Death Blossom, Death Blossom Lite, Empty Rectangle. Bookmark the permalink. be really one thing that I feel I’d never understand. I’ll attempt to get the grasp of it! Don’t look forward, look back. All the way back. The beginner’s page and early posts give the basic principles involved. I wouldn’t be able to understand my current posts without them. Hi there, nice article! Are you a pro copy writer? How can I write as good as you? Do I have to go through some manuals regarding authoring like online work projects? My apologies for off topic. No. Have a topic you believe in, “hear” what you’re saying, and edit, edit, edit.